" Peace needs to be deepened. There are no permanent angels or permanent devils in any community. This film is a resource of best practice. It reflects the indomitable spirit of the Kenyan people." The launch took place on June 11th in the Amani Room of the Serena Hotel in Nairobi. 'Amani' means peace in Swahili and the room acquired its name after Kenya's post-election violence in 2008. It was here that Kofi Annan brokered the National Peace Accord and the formation of Kenya's present coalition government. Among the many distinguished guests at the premiere were Maina Njenga, former leader of the notorious Mungiki militia group (who recently had a Christian experience that turned him away from violence); S.K. Maina, National Co-ordinator of the Peace-Building and Conflict Management Secretariat of the Kenyan Government; Bedan Mbugua, General Manager of Royal Media; Ruth Sugow, Chair of Maendeleo ya Wanawake, the largest women's organization in Kenya; James Magaria, Chairman of Karen Hospital, and renowned cinematographer Sir Mohinder Dhillon. Florence Mpaayei, Executive Director of Nairobi Peace Initiative-Africa, opened the evening with a call for one minute of silent prayer. When the film had been screened, Rev Dr Sam Kobia, former General-Secretary of the World Council of Churches, and moderator of the evening, opened the floor. Pastor James Wuye and Imam Muhammad Ashafa answered a string of questions from the floor, returning constantly to the themes of forgiveness and dialogue. At the end of the evening, Joseph Karanja, representing Initiatives of Change Kenya, gave a vote of thanks. He expressed gratitude to Serena Hotels, for making the venue available without charge, and the numerous other organizations and individuals who had made the film launch such a success. Early the next morning, Imam Ashafa, Pastor Wuye and Dr Alan Channer travelled to Eldoret, at the invitation of the International Organization for Migration, which has a programme of peace-building and social rehabilitation in the district. 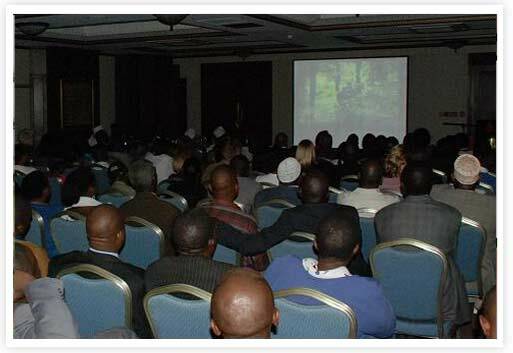 IOM arranged for representatives from the Kikuyu and Kalenjin communities in Burnt Forest, where the film was shot, to attend the screening in Eldoret's Noble Hotel. Much of the discussion after the film was on the nature of true apology. 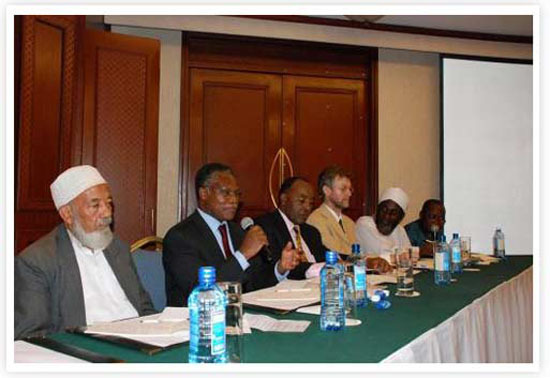 A programme for use of the film in peace-building in Kenya and the region is in preparation. The next major screening of An African Answer will take place at the Caux Forum for Human Security, in Caux, Switzerland, on July 10th.